Hello Kitty Fashion Music Wonderland: Open to the public, this energetic hub is inspired by the styles of Tokyo and Japanese pop culture, putting Hello Kitty at the center of the ultimate fan experience at Comic-Con Interactive Zone at Petco Park. Hello Kitty's band of Lolitas, who personify a colorful mix of anime, cosplay and Japanese street style, will host fans at the experience. A retail pop-up shop will offer a mix of event-only and limited edition Japanimation-themed collectible Hello Kitty items, including a free poster with any purchase. Hello Kitty will be present to meet her fans in a Japanimation-style outfit that mirrors the collection of products that will debut at the show. On Friday, July 19th and Saturday, July 20th, a nail artist from Tokyo will be on hand to treat fans to a free Sanrio nail art application with any $25 purchase from the pop-up shop. Kitty-chan Secret Space: Inside the convention center, the fan experience continues at "Kitty-chan Secret Space" (booth 4537). 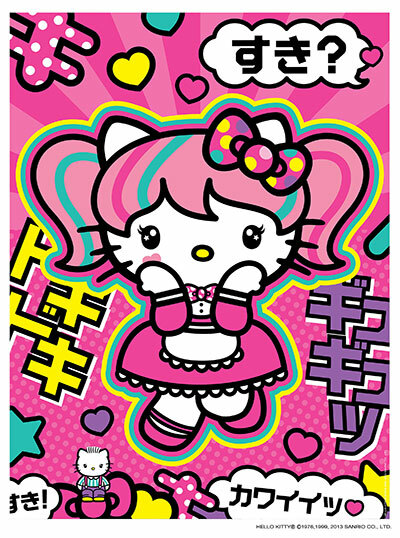 A term of endearment used for Hello Kitty in Japan, "Kitty-chan" is a nod to superfans and a clue that this Comic-Con Hello Kitty is truly distinct. Comic-Con badge holders will have access to the limited edition pink Hello Kitty flocked collector's figure by Funko that will go on sale each day. The first 50 fans to purchase the figure on Friday, July 19th and Saturday, July 20th will also receive a free customized drawing by one of Sanrio's lead designers from Tokyo. Hello Kitty Comic-Con on Social Media (#HelloKittySDCC): Fans can stay connected with all things Hello Kitty at Comic-Con through a variety of social elements aimed at both Comic-Con goers and those not attending the event. Hello Kitty's millions of Facebook, Twitter and Instagram friends can share photos and access contests and behind-the-scenes footage to connect with their Hello Kitty fan community. The fun starts before Comic-Con with a Fan Fiction contest tied to the launch of the new graphic novel. Fans on-site and at home can stay engaged and entertained through a different interactive social media event each day of Comic-con including Uglydoll and Street Fighter promotions as well as a free download of the Japanimation photo app for a limited time.